What Do Your Customers Want: More Yelp or More Foursquare? If you’re reading this, it’s likely that you’re looking for information on how to better allocate your efforts and resources as it relates to review monitoring and reputation management: Yelp or Foursquare? It would be easy for us to point you to one review site over the other, but before we rush into conclusions, let’s explore together the features and trends that may make one more valuable than the other, in terms of the specific needs of your business or enterprise as well as your overall reputation management strategy. The content, emotion and facts conveyed in Foursquare have a tendency to be more accurate since they are most frequently captured on-location. By the time a customer gets home and decides to voice a more text-heavy opinion on Yelp, their recollection has greatly diminished. In fact, 80 percent of the sensory feedback we receive does not remain in our memories after a 24-hour period. If your customer base is seeking out accurate, unbiased feedback, and they are familiar with both review websites, it is highly probable that they will pick Foursquare over Yelp. As we begin to evaluate what business value each review website has for us, we need to consider our target market. If the nature of your business is dependent on one-time hits instead of repeat engagement, you can probably obtain the most value for your buck by focusing on Foursquare. Local reviewers with potential for repeat business have a higher proclivity to share their opinions at length on Yelp instead of providing snapshots on Foursquare. If your goal is to have loyalty-based buzz, keep your eye on power Yelpers and make sure you are creating a feedback-conducive environment. While Yelp users can be great allies, it is not infrequent to be subject to high-maintenance Yelp customers that might just require a more focused approach. If your business is in a highly urban or business-heavy setting, customers are likely to be busy and seek out online reviews as a tool to be more efficient in their selection process. To this end, Foursquare, having a smaller, more focused delivery that provides actionable items in digestible portions, makes more sense. Moreover, because Foursquare has a higher tip acquisition velocity than Yelp, their information tends to be more up-to-date. On the other hand, if your location happens to depend on high tourist influx, you are most likely to benefit from the depth and nuances of Yelp. Vacationers are more intentional in conducting research to help them prioritize which venues to visit in order to get the most of their leisure time. This does not mean that these websites are self-exclusionary. The best bang for your buck is achieved by having an across-the-board presence aimed at reinforcing the popularity of your venue as perceived by those searching for options online. Managing your online reputation is best achieved holistically. Pent-up anger is a powerful thing and Yelp has become a main avenue for disgruntled customer venting. Satisfied customers seldom provide online feedback. On the contrary, dissatisfied customers are always on the lookout for a way to convey their concerns. Ravers and those wishing to give a business a pat on the back tend to seek the path of least resistance. To this end, a Foursquare tip becomes an instant and easy means to engage, without the burden of allocating extra time above and beyond the customer’s visit to express his/her opinion. Encouraging on-location engagement via Foursquare possesses a higher potential of providing future customers with valuable and positive information and tips to help them make the decision to point their hard earned dollars your way. Do you provide a product or a service that is not research-intensive? Perhaps you are a full-service gas station, or your restaurant is located in the middle of all the tourist action in NYC. If that is the case, customers are searching for you from their mobile. Foursquare Tips offer great potential in guiding customers in a rush to make a decision. Small pieces of information are easy to view from mobile platforms and easier to process in making a decision on the spot. What about if your offering has a higher price-point or higher risks? If you are a remodeling company, or perhaps a medical professional, rest assured those seeking someone in your segment are likely to want to get more than a tidbit. Details, nuances and the credibility of a bad review are what they are looking for. Invest your time engaging in review responses that provide sales-conducive insights and convey a deep level of customer commitment when it comes to handling negative reviews. 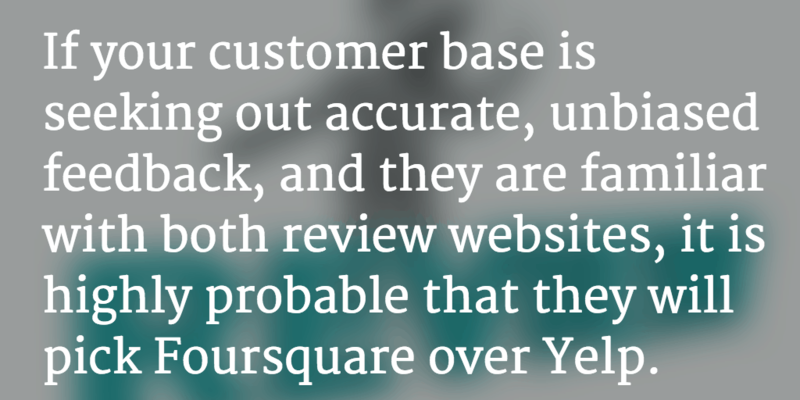 The way you manage your Yelp presence has tremendous potential to make or break you. One review website is not better than the other. Instead we should approach the dilemma based on the specific needs of our business or by observing data-capture trends. If you see that you are getting more engagement in one site versus the other, consider doing a deep-dive and see if it is worth your time and effort to shift your attention to the website yielding the least volume. At the end of the day for most local business I think Yelp is ticket. the other sites are nice but they just don’t have the audience that Yelp does.